Ferry and holiday company Brittany Ferries has reported a huge increase in the number of four-legged travellers over the last five years. In 2017 the company’s ships hosted nearly 40,000 more dogs than it did just five years previously. Altogether 91,289 dogs and cats travelled in pet-friendly cabins and kennels on routes to Spain, as well as in cars on the shorter journeys to France. And the trend shows no sign of tail-ing off: the company says it expects to carry more than 100,000 dogs to travel in 2018. The rise in four-legged travel coincides with the Chinese New Year of the dog, which falls on the 16th February 2018. The Chinese regard dogs to be lucky animals, which symbolise success and the coming of good fortune. With ten more pet-friendly cabins being added to cruise-ferry Baie de Seine and the April 2018 launch of Brittany Ferries’ newest fleet member, Connemara, the company is ready to accommodate a record number of pet travellers in 2018. Additionally, the arrival of brand new ferry Honfleur in June 2019 will add 12 pet-friendly cabins to the company’s most popular Portsmouth to Caen route. 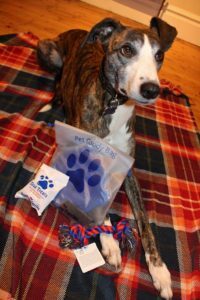 As well as offering pet-friendly cabins and kennels, Brittany Ferries also offers a free pet goody bag to dogs travelling in a pet-friendly cabin. This includes, a pop up bowl, a bag of treats, a chew toy and three disposable bags. www.holidayfrancedirect.co.uk/AT004929 – a renovated barn to let with pool in Castelmoron, Lot et Garonne, Aquitaine. www.holidayfrancedirect.co.uk/LL005165_A – beautiful Loire cottage set in magnificent woodland perfect for walkies. www.holidayfrancedirect.co.uk/UH004563 – an 18th century gite in the Limousin. Ships and options for pet travellers with Brittany Ferries.